Discussion in 'SWNN News Feed' started by SWNN Probe, Jan 29, 2019. Star Wars fans everywhere rejoiced when George Lucas finally returned to a galaxy far, far away with the release of The Phantom Menace in May of 1999. The resurgence of Star Wars also brought the return of various toys and merchandise back into the wide open arms of fans everywhere. Through the years, Star Wars toys were primarily handled by Kenner Products (until the company was purchased by Hasbro in the 1990's), but the return of the saga saw a new company join the ranks and in 1999 LEGO released their first licensed product line of Star Wars merchandise. The LEGO and Star Wars partnership has brought us some incredible toy sets from the Star Wars universe, from the first X-Wing released in 1999 all the way to the largest LEGO set ever created, the massive 7,541 piece Millennium Falcon released in 2017. Now some 20 years later LEGO Star Wars is celebrating two decades by releasing five new toy sets featuring iconic ships and vehicles from the Star Wars universe. The new sets will celebrate some of the iconic scenes and moments from the original and prequel trilogies. Each set will also come with a 20th anniversary collectible minifigure in tribute to the history of the line. Although these sets won't release until later this year, you can check them out below ahead of release. First take a look at this Imperial Dropship. The set includes three regular Stormtroopers and a Shadow Trooper for the cockpit. The set also comes with the Han Solo 20th Anniversary collectible minifigure. Next up is the Clone Scout Walker and the Dwarf Spider Droid set. The set comes with the Walker, Droid, Kashyyyk Trooper, a Wookiee and a Battle Droid. Also included is the Darth Vader 20th Anniversary collectible minifigure. The Snowspeeder set is great if you can't get the Ultimate Collector Series version and is complete with Luke Skywalker and Dak Ralter minifigures, a Rebel Trooper, and a stud shooter. The set also comes with the Lando Calrissian 20th Anniversary collectible minifigure. Fancy the life of a bounty hunter? 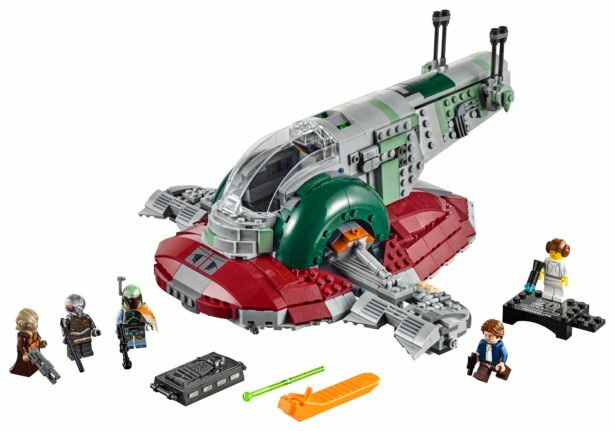 If so, the Slave 1 set is definitely for you. The set comes complete with Slave 1, Han Solo (both frozen and not frozen in carbonite) and Boba Fett. 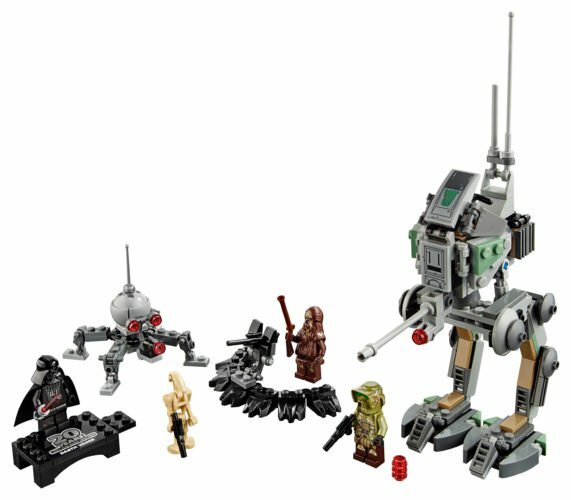 It looks like Zuckuss and 4-LOM minifigures are included as well. The set also includes the Princess Leia 20th Anniversary collectible minifigure. 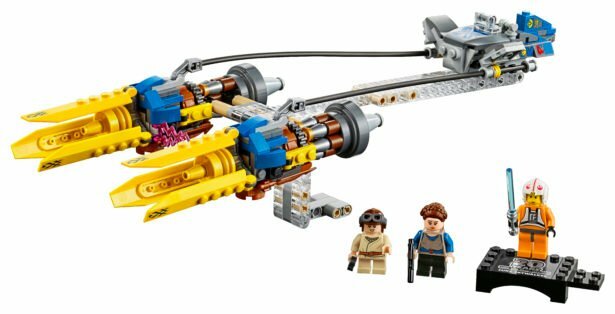 Last but not least, it wouldn't be a 20th Anniversary celebration for LEGO Star Wars without the release of a set from The Phantom Menace, Anakin's pod racer! The set includes a young Anakin Skywalker and Padme Amidala. The set also comes with the Luke Skywalker 20th Anniversary collectible minifigure. Congratulations to LEGO Star Wars for an amazing 20 years of incredible success, and hopefully many more to come. As an avid LEGO collector and fan, I am stoked for these sets to release later this year and I cannot wait to get my hands on them. Hopefully some of these sets, if not all of them, will be on display at Star Wars Celebration Chicago for the 20th Anniversary of Star Wars: The Phantom Menace. Wish I was 10 again. I would have definitely be picking these up. I'm about to turn 26, and I'm definitely going to go out of my way to get those. Ok it helps to have an 11 yr old son.....who keeps me 11 at heart!!! Grew up addicted to Lego, Happy anniversary of block building. UPDATE 2! First Official LEGO and Hasbro Toys from Solo: A Star Wars Story Revealed!